A MISGUIDED VISION FOR BARAN PARK? Once, our domes stood as the iconic image for Milwaukee County. Now they are in need of a major facelift. They have water damage, cracked windows, spalling concrete, and HVAC problems. They need more attendance, more press attention, dollars, and more public involvement. So far, cost estimates for renovation are astronomical, and County Executive Chris Abele is making it clear that all options for the Domes are open, including demolition. There is hopeful news. A committed task force is overseeing the search for solutions. (POP board member Bill Lynch is the task force chairman.) A comprehensive new study by several firms will analyze the Domes' architectural, financial and cultural prospects. The study is led by Hamell, Green & Abrahamson (HGA), an architecture and engineering firm with offices here and in seven other U.S.cities. More good news: the National Trust for Historic Preservation has named the Domes to its “national treasures” and “most endangered” lists and is partnering with a local nonprofit group, Milwaukee Preservation Alliance, in a Save Our Domes campaign. 1) Purchase a Domes membership (4141-257-5611). 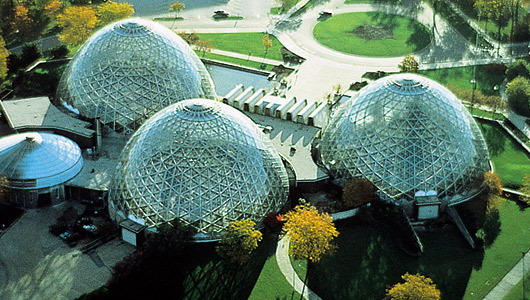 2) Join the Friends of the Domes (414-257-5511).